This article first appeared in The Edge Financial Daily, on August 2, 2016. PUTRAJAYA: 1Malaysia Development Bhd’s (1MDB) announcement that its 2013 and 2014 audited financial statements should not be relied upon will not affect the state fund as it no longer has bank loans and doesn’t plan to borrow money, said Second Finance Minister Datuk Johari Abdul Ghani. “Before, there was a lot of implication because 1MDB had a lot of exposure with almost all the local banks,” said Johari. “But today, all these banks no longer have such exposure. None of the local banks has anything outstanding with 1MDB. It is all fully paid, so basically 1MDB doesn’t have any exposure with any local bank. 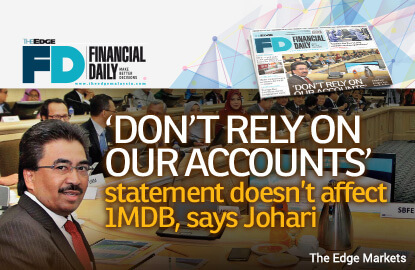 “As you know, I’ve already told the public before this: There is no more borrowing from 1MDB,” Johari told the media after chairing the 2017 Budget focus group meeting yesterday. He said the 1MDB’s statement bears no impact or significance anymore because the fund will not use the audited accounts to borrow from banks. He was replying to a question on the implications of 1MDB’s announcement last week that the audited accounts should not be relied on pending the lawsuits filed by the US Department of Justice (DoJ) which alleges that funds were laundered from 1MDB. In the suits filed on July 20, the DoJ is seeking to seize more than US$1 billion in assets "involved in and traceable to an international conspiracy to launder money misappropriated from 1MDB". Those named in the suits included Riza Aziz and businessman Low Taek Jho (Jho Low), and Abu Dhabi government officials Khadem al-Qubaisi and Mohamed Ahmed Badawy al-Husseiny. The suits said funds misappropriated from 1MDB were transferred to the co-founder of Petrosaudi, a company that had a joint venture (JV) with 1MDB, and thereafter to a high-ranking official in the Malaysian government identified only as "Malaysian Official One". On the debt payment dispute between 1MDB and IPIC and Aabar Investments PJS Ltd, Johari said Putrajaya is “very confident” that 1MDB will win the arbitration case filed by IPIC. IPIC is seeking US$6.5 billion from 1MDB and the ministry of finance (MoF) in the dispute. The dispute started earlier this year when both IPIC and Aabar said in a joint statement that the British Virgin Islands firm with an almost identical name, Aabar Investments PJS Ltd (Aabar BVI), “was not an entity within either corporate group.” 1MDB had transferred US$3.5 billion to the entity in 2012. “It’s too bad that they don’t acknowledge because as far as the record is concerned, the company belongs to them,” Johari said, maintaining 1MDB’s stance that its records show that IPIC owns Aabar BVI. 1MDB said the company records show documentary evidence of the ownership of Aabar BVI and of each payment made, pursuant to various legal agreements that were negotiated with Khadem al-Qubaisi in his capacity as managing director of IPIC and chairperson of Aabar and/or with Mohamed Badawy al-Husseiny, in his capacity as the chief executive officer of Aabar. As a consequence of the dispute, 1MDB defaulted on its interest payments on bonds raised by 1MDB, after IPIC refused to fulfil its part in a deal with 1MDB to make the interest payments on the bonds in exchange for taking over some 1MDB assets. The Abu Dhabi’s sovereign wealth fund eventually made the interest payments, but submitted its arbitration request to the London Court of International Arbitration against 1MDB and the MoF in June this year.